Henri Louis Scott was born in Le Havre and studied there with François de l’Herbe. He was an accomplished painter of landscapes and town views, as well as an illustrator and print maker. Many of his subjects capture the haunting beauty of the Normandy coast in the region of his native Le Havre. Scott began exhibiting at the annual Paris Salon in 1872, and was a medalist there before receiving the honor at the 1883 Salon of the French state acquiring his monumental painting, Les Funérailles de Gambetta, which is now in the collection of the Musée de Cahors. The artist was at the prime of his career when in 1884 his life was cut short. 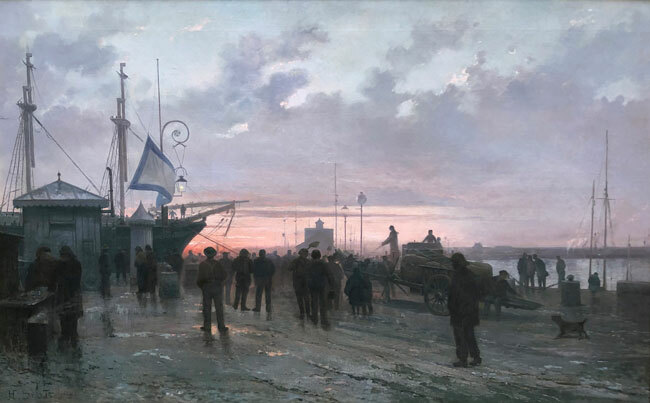 Please contact us if you are interested in selling your Henri Louis Scott paintings or other artwork from the 19th century and early 20th century.